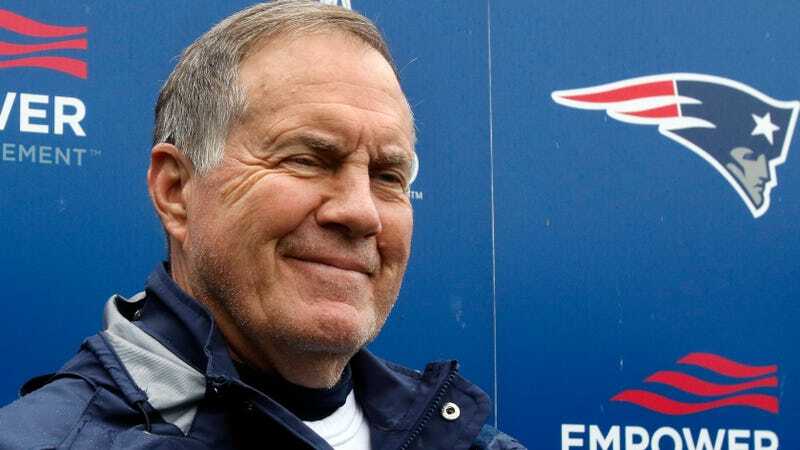 Bill Belichick met with reporters today, marking his first media availability since Tom Brady’s wife, Gisele Bündchen, went on TV and said that her husband has played with unreported concussions. Belichick fielded 18 questions, and not a single one was about Bündchen’s comments. Is there any chance Belichick would have answered such a question with anything more than vague grumbling or seething silence? No. Is it still extremely embarrassing for all the reporters in that room to have failed to even broach the subject? Absolutely. It’s not shocking to hear that Brady has had concussions and concealed them from the team—the very nature of football all but ensures that every player will suffer brain injuries and be incentivized to hide them—but the wife of the greatest quarterback in NFL history pulling back the curtain and making the implicit explicit is still a big story. It’s certainly enough of a story to warrant a few pointed questions at Belichick. What do you notice from Tom Brady on a daily basis that helps him maintain his high level of performance? Is it nice to be hosting the NCAA Lacrosse Championships at Gillette Stadium? Who do you think will win the NCAA Lacrosse Championships this weekend? More than anything, this is a reminder of just how easy it is to render the football press completely useless. When you put a famously prickly coach in a room full of access-dependent reporters on one of the most competitive beats in the league, you end up with one of the biggest stories of the offseason—one that gets straight to the heart of the NFL’s ongoing concussion crisis—ceasing to exist all together.